SUMMARY: Combined with other 'big data' analytics, aggregate results from health risk assessments or health risk appraisals (HRAs) become the building blocks of population health management programs designed to bend the healthcare cost curve. 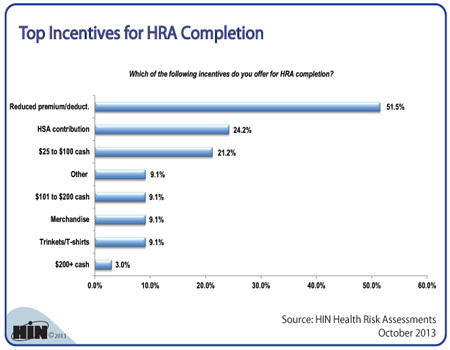 We wanted to see which incentives healthcare companies offer for HRA completion. Download the executive summary of 2013 Healthcare Benchmarks: Health Risk Assessments. 2013 Healthcare Benchmarks: Health Risk Assessments provides metrics and measures on current and planned HRA initiatives as well as lessons learned and results from successful health assessment programs. 2013 Healthcare Benchmarks: Health Risk Assessments is available from the Healthcare Intelligence Network for $127 by visiting our Online Bookstore or by calling toll-free (888) 446-3530.